Despite Rich Be em and Mike Weir entering the Deutsche Bank at 113th and 88th in FedEx Cup point respectively, nothing held the two back from firing low scores on Friday. 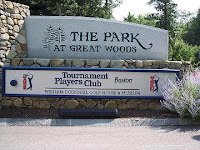 Beem, the 2002 PGA Championship winner, and Weir, the 2003 Masters champion, finished Friday at 9 under par for 36 holes at the TPC of Boston (left). The two major champions found themselves tied with Aaron Baddeley, and ahead of Vijay Singh, Tiger Woods, and Phil Mickelson. However, Phil Mickelson and Tiger Woods are back in contention with stellar Friday rounds, which both paled in comparison to the mediocre starts on Thursday. Woods followed his opening 72 with the day's low score, 64. Tiger is now in 13th, only three strokes behind Baddeley (right) , W eir, and Beem. Also tying the day's low, Phil Mickelson followed his 70 with a 64 to finish in fourth, 1 stroke behind the leaders. Also tied for fourth, U.S. Amateur Champion Ryan Moore and PLAYERS Runner-Up Sean O'Hair sit at 8 under after 36. Camilo Villegas, the first round leader, followed a magnificent 63 with a highly disappointing 72. While Weir and Beem both needed a miracle to make next week's field of 70 players, the two are both projected to leap into the next playoff event. 0 Response to "Badds, Weir, and Beem share lead at Deutsche"